Efficiency, productivity, collaboration – in the conversation around the rising popularity of smart offices, these are the most often discussed benefits. Indeed, so great are these advantages that smart workplaces are no longer geek hubs, reserved only for tech giants. From innovative start-ups to chic new coworking spaces, organisations across various industries are going smart with their office design. Another – often overlooked – benefit that smart offices bring to the table is ensuring inclusivity. Organisations today are more diverse than ever before. Modern offices showcase a healthy gender ratio amongst their workforce. 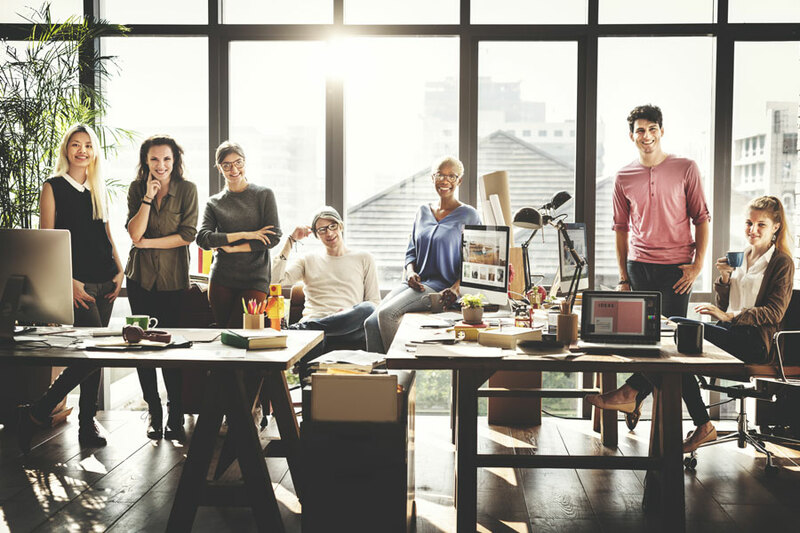 Older, seasoned employees work side by side with enthusiastic young millennials. And in truly global companies, one sees people from different countries and cultural backgrounds working as a team. Therefore, in conceptualising a truly modern office design, one needs to focus not just on productivity and efficiency, but also on accessibility and inclusivity. Smart work desks and ergonomic furniture are simple but effective ways of fostering inclusivity in a workplace. Rather than offering one seating solution for all, they let people choose exactly how they would like to work. While older employees may prefer sitting down through the day, a young worker suffering from posture-related back issues may want to work at standing desks at regular intervals. Innovative furnishings that can easily be converted into standing desks are useful additions to any workspace. Companies like Humanscale use IoT to give users an optimal sit-stand experience. The sensors on the desks track movement, and alert employees when they’ve been sitting or standing too long. After the touch revolution of the last decade, VUI (Voice User Interface) technology is currently having its moment in the spotlight. Amazon’s Alexa, Google Assistant and Microsoft Cortana have all become an integral part of many homes around the world. Companies too are adopting voice technology in their day-to-day functioning. Thanks to services like Alexa for Business, employees can quickly find available meeting rooms, manage calendars and streamline tasks. But convenience is not the only benefit. VUIs can make a workplace more inclusive for visually-impaired employees and those with weakened motor functions who find it difficult to work with touch interfaces. Older employees with diminished sensory abilities, too, may find it intimidating to use technologies that need a high level of user interaction. As one study demonstrated, 75% of senior citizens who are not comfortable with modern technology, preferred VUIs over keyboard interactions.1 The key to inclusivity is to offer various options in terms of UI, so that people with different requirements can pick the one most they’re most comfortable with – and VUIs help companies do just that. Women’s metabolic rates differ from that of men, but many offices still set their thermostat based on data from the 60s, when a majority of office workers were male. Despite making up almost half the workforce, women employees often find themselves huddling at their desks or bringing blankets to work. In fact, from pregnancy and hormonal changes to factors like a person’s BMI, diabetic conditions, or side effects of medicines – there are lots of reasons why some employees feel hotter or colder than others. It is almost impossible to pinpoint one ‘perfect’ temperature that works for all. But the Internet of Things offers a way around this. One example of IoT in action is the Agnelli Foundation headquarters in Turin that features ‘environmental bubbles’ that follow people around the building. These bubbles are created by customised heating, cooling and lighting solutions, powered by data like occupancy of a room, CO2 levels and outside temperature. The space also empowers employees to adjust the lighting and temperatures around their work desks with the help of a smartphone app. Being able to create such micro-environments can make each employee feel comfortable, without the fear of inconveniencing others, or the awkwardness of having to discuss their private health concerns. Imagine having to rush for a meeting from one end of a large office campus to the other, only to realise that your conference room is not free, or that your meeting has been rescheduled to take place in a different location. Anyone would feel chagrined at the wasted time and effort. But can you imagine the frustration this would cause someone who is pregnant, wheelchair-bound or is merely new to the office, and is unfamiliar with the space? Companies like VMware are tackling such logistical issues with the help of beacons and smart apps equipped with wayfinding technology. The VMware campus in Palo Alto has 17 buildings and over 2300 employees. So the company has deployed apps that help employees locate empty meeting rooms, find available charging spaces for electric vehicles, or simply find their way around the campus. Unobtrusive security measures like facial recognition, fingerprint technology or retina scanning can reduce physical dependency on a space too. Parents, caregivers and those with physical restrictions can enjoy the flexibility of working from home without the fear of compromising sensitive data. Such technology is also useful for companies whose offices have many breakout zones, cafés or alternative work areas for employees. One very traditional piece of office equipment that has kept up with the times is the whiteboard. First introduced in the 60s, they have remained an important tool for collaboration all these years. Now its newest avatar, the interactive whiteboard, is helping organisations become more inclusive as well. Interactive whiteboards let multiple people collaborate and add their notes in real time – even if some of them are working remotely. This means new parents and caregivers who have opted to work from home or team members working from a different office location need not worry about missing out on important discussions that have taken place in their absence. In addition to bridging physical distances, technology has come a long way in bringing together people from different cultures too. With more organisations expanding globally, employees face with the unique challenge of having to collaborate effectively with colleagues from different countries or communicate with clients with whom they may not have any language in common. Collaborative tools like Slack offer translate features to enable efficient conversations through messages, while apps like iTranslate Voice 3 and TripLingo supports voice translations. Wearable translators like the one by ili are steadily gaining popularity with those who frequently travel for work. They work accurately in real-time without the need for internet data, thereby making a trip to a new country that much more comfortable. A smart office, therefore, is not just one that encourages ideation and enhances workplace productivity by preventing that mid-afternoon slump. It is one that brings together intelligent spatial design and smart technology, to be a welcoming space for all. It empowers employees by letting them choose the work environment that they are most comfortable with – irrespective of their gender, cultural background, health situation, or personal restrictions. When your company welcomes talent from different walks of life, an inclusive workspace takes priority over other design considerations. For a discussion on how your office can get smarter and more inclusive, get in touch with us.